At Ziba, we began making our own almond mylk a decade ago when everything we found in stores contained concerning additives. Thanks to an increase in the popularity of alt-mylks as well as their numerous health and environmental benefits, we’re sharing our recipe. We love to enjoy our almond mylk in cereal, smoothies, baked goods, sauces, or simply cold from the fridge. Soak 1 cup of Ziba almonds for 12 hours/overnight** in 4 cups of filtered water, or enough water to fully cover the almonds (you might need slightly more depending on the size of your bowl or pitcher). Drain any remaining water after your soak and rinse the almonds under running water. Remove and discard any loose skins. Place the drained almonds into the blender with one cup of filtered water. If you choose to include the pitted dates for sweetness, add them now. Close the blender lid and blend on low speed for 3 minutes. Add another cup of filtered water and blend on medium speed for 3 minutes. Slowly add the remaining two cups of filtered water (and the optional maple syrup, if using) while continuing to blend for another 2-3 minutes on medium speed. Pour the contents slowly through the cheese cloth over a large bowl or pitcher, dividing it into 2 or 3 batches depending on the size of the cheese cloth. Gently squeeze the cloth with your hands to push the excess liquid out from the almond meal. You can discard the meal or use it in cakes or granola. Using the funnel, slowly pour the mylk into your glass bottle. You might have more than will fit into the bottle, but this is perfect as you can enjoy a drink now and still have a full bottle in the fridge. Refrigerate the almond mylk and consume within 3 days. *Depending upon how thick you like your almond mylk you, can increase or decrease the amount of water this recipe calls for. 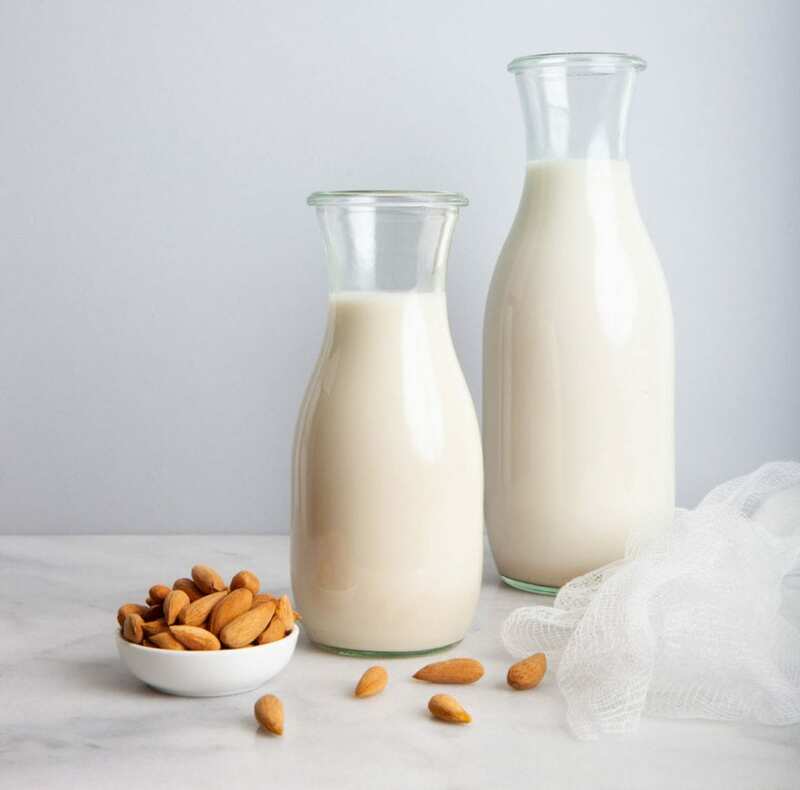 A ratio of 1 cup of Ziba almonds (pre-soak) to 3 or 4 cups water will give you a much creamier mylk, whereas a ratio of 1:6 will give you a lighter mylk. Add water as you go until you reach your desired creaminess. ** You can soak the almonds for up to two days but be sure to refrigerate them if you plan to soak longer than 12 hours as they can spoil.